Oklahoma Connection | Hoffman came to Guthrie from Kansas in the Land Run of 1889. General Roy Hoffman and General Charley Barrett were prime movers in organizing the nucleus of a military regiment known as the First Oklahoma in 1899. Major General Roy Hoffman came to Guthrie, Oklahoma, in the Land Run of 1889 and founded the Guthrie Daily Leader that same year. He was admitted to the bar in 1892 and began a career which combined law, business and the military. He joined the army as a volunteer private in the Spanish-American War (1898) and was a captain at the time of his discharge. Hoffman went on to organize a military regiment in the newly formed Oklahoma National Guard and was made its colonel. 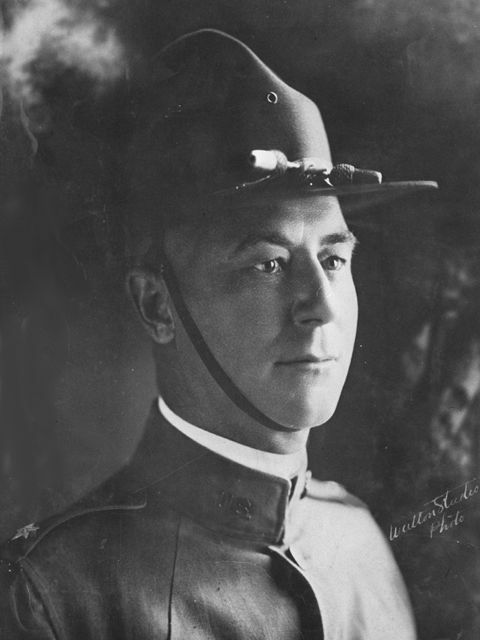 For sixteen years Hoffman led the Territorial and State Guard, and in 1917 served in World War I where he became the first National Guard officer to be promoted to brigadier general. He returned to Oklahoma after the war and became a leader in the American Legion and twice-served as national commander of the Reserve Officers Association. He was promoted to major general in the reserve forces. He also served Oklahoma as a leading attorney, judge, and official in bank and oil companies.